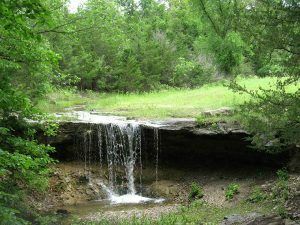 A favorite campsite near the Independence Crossing, a famous ford where pioneer wagons forded the Big Blue River, Alcove Spring originates in an unusual rock formation and falls over a rock ledge into a pool below. Here, over the years, emigrants carved their names in the rocks surrounding the spring, and many of these carvings are still visible. This area was well-known to early day traders and mountain men as well as to later travelers to the Far West. 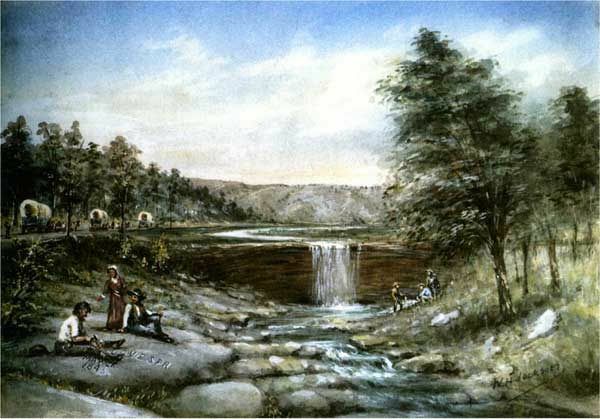 John C. Fremont and his 1842 exploring expedition camped at Alcove Springs and Marcus Whitman led a thousand emigrants to Oregon who stopped at at the Springs in 1843. Utah bound Mormons and California bound gold seekers followed, including the Donner party, most of whom later froze or starved in the Sierras. One member of the Donner Party — Sarah Keys, Margaret Reed’s mother — died here of consumption while the party was waiting for the river to fall enough to cross. She was buried somewhere in the area. Other travelers described it as “a beautiful cascade of water” and “it was one of the most romantic spots I ever saw”. Because Kansas was not open to settlement during the heyday of the Oregon Trail, few who traveled across this area ever lived here. 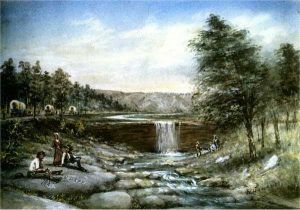 Many, however, wrote of the beauty and fertility of the land. Their descriptions of the Kansas and Blue River valleys helped dispel the myth of the “Great American Desert” and encouraged others later to settle in Kansas. Listed on the National Register of Historic Places and considered one of the most significant historic sites on the Oregon Trail in Kansas, the spring is productive all year round. Alcove Spring is located about six miles south of Marysville, Kansas at 1834 E. River Road, Blue Rapids, Kansas. Travel there from Blue Rapids by taking US-77 north to Schroyer Road. There is a small sign on the highway just before the Georgia-Pacific gypsum mine. Follow Schroyer Road five miles north to the park. Schroyer Road is gravel and is rough in wet weather. A 223-acre park offers a self-guided walking tour and interpretive exhibits. From Highway 77 north of Blue Rapids go west on Tumbleweed Road and follow signs for about 6 miles.